Ishasha region in Queen Elizabeth national park situated far from the trading Centre’s and towns and this particular area receives less number of tourists than its counter part in the opposite direction north, but what is interesting, the few visitors who spare their time to visit this remote area are greatly paid with the interesting sights of the rare Ishasha tree climbing lions which are making highlights for the many safaris to Uganda. The rare species of the King of the Jungle which can be seen lounging and lying in the tree branches while busy keeping a keen eye contact to the rare species of the herds of Uganda kob can only be found in the Remote Ishasha region. It is really rare to find the lions which climb trees, but your safari to Uganda specifically to Ishasha will enable you to interact with one of the two populations of tree climbing lions in the whole world. 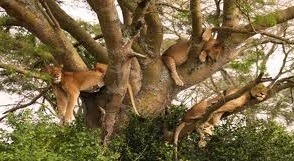 The interesting lions which climb trees in Ishasha sector are one of the populations of the lions which have the ability to climb the trees and the other tree climbing lions can only also be found in the Lake Manyara National park in the southern part of Tanzania. The reason as to why these lions climb up is not known and therefore on your safari to Uganda you will spend some time studying the characters of these tree climbing lions will may in one way or the other help you to come up with the right reason as to why these species climb trees. According to the rising suggestions, some claim that this type of lions climb trees and stay in the branches of trees as a means of protecting themselves from the various attacks and bits from the deadly tsetse flies roaming on the ground level, while other people assume that lions actually climb and stay into the branches of trees in order to provide shade for themselves from the tree leaves and branches and in this way they will be escaping from the direct heat coming from the direct sunshine which strikes directly the ground. But up to date no clear reason is given . so your visit will help educate the world about the rare behavior of the tree climbing lions. The remote Ishasha Sector is currently popular due to the existence of this rare tree climbing lions that are uncommon and exceptional in the whole world and therefore for any traveller who is seeking for unique experience in his or her Uganda safaris should include visiting the Ishasha region in Queen Elizabeth National Park.